Aldea Malvada in Tierra Robada, San Andreas. 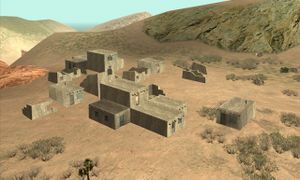 Aldea Malvada is a small, isolated ghost town at the northeastern edge of Tierra Robada, San Andreas. It is situated on top of a large rock formation just east of El Quebrados, and west of Arco del Oeste and Sherman Reservoir. It appears to be the remains of a village whose origins are likely older and from a different culture than those of Bone County's ghost town, Las Brujas, likely ruins from the Anasazi or Ancient Puebloan tribe. The name Aldea Malvada translates roughly from Spanish to Wicked Village. It may be based on Pueblo Grande de Nevada, a real-life ancient Pueblo village in Nevada. A major part of the Misappropriation mission given to you by the C.R.A.S.H. police officer, Frank Tenpenny, occurs here.